Bejeweled by PopCap is a classic title puzzle game for $1. The game is all about solving the puzzle by matching 3 or more like colored gems. Its the world $1 puzzle game for the iPhone and iPad. The game offers over 5 game modes to play through to have endless amounts of funs. Graphics wise PopCap did a nice job with the look and feel of the game. However they’ve taken quite a bit of time to update the game for the iPhone 5s retina display. Any fan of puzzle games will enjoy bejeweled simplicity yet addictiveness. The game modes break down into five challenging game styles. Classic is the basic puzzle game where you aim to score a certain score by solving the puzzle in a certain time limit. Lightning game mode is based on speed and puts your gem swapping abilities to the test. Butterflies mode uses unique butterfly gems, your task is to avoid running into the spiders near the end of the puzzle. Next is diamond mode, where your tasked with digging through the mine by solving the puzzles. Digger deeper each combination. Lastly is zen mode a way to kick back and play the game peacefully. As you play along into the modes you get nice badges and achievements to show off in the leaderboards. Each mode offers every user something. Whether your into classic matching or timed/speed mode this game appeals to many. Special gems also exist in the game from flame to supernova gems which have their own effects. The secret sauce behind a game like this is the pure addictive nature of it. You can play it anytime and almost anywhere. Puzzle lovers will enjoy the ability to play on the go in an assortment of modes. It keeps your brain on the edge while giving you some entertainment. The classic bejeweled title couldn’t be transitioned anymore better. 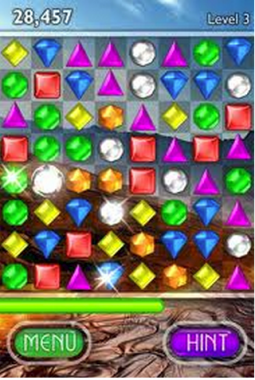 Puzzle lovers will really enjoy bejeweled it packs multiple game modes into a cheap $1 app. The classic mode enough is worth the money and everything else comes as a bonus. Controls are simple and the puzzles get more difficult as you progress. Its a combination of speed and smarts to solve each puzzle. Making one move can cost you a bigger combo that would’ve let to a higher score. The animations of the game handle great whether its a simple animation or a big gem combo they handle really well. Bejeweled is a great puzzle title at $1 and is a fun game to carry around on the iPhone and knock out some levels. Find it in the app-store today.